This is what we call ontbijtspek here. It’s kinda like bacon, only much salter. They come in small portions. I’ve cooked four thin slices and drained them on a paper towel. I’m not using too much, but feel free to add as much bacon as you like. I’ve also chopped a spring onion with my cute orange baby Santoku. And I’ve finely chopped a small handful of flat-leaf parsley. Gotta love the stuff. You can use any herb you like, though. Add the spring onions, parsley, crumbled up bacon and a good pinch of pepper to 4 oz firm cream cheese; I’ve opted for low-fat cream cheese. Mix it all up. Adding a little garlic, chili pepper and/or grated cheese also tastes great! Just go wild! Think of fun combinations. Make a fairly deep cut in each chicken fillet. And spread 1/4 of the cream mixture in there. My puff pastry sheets were fairly small, so I’ve used two for each chicken fillet. I kinda stuck them together, and flattened them a little with my dough pin. Until I ended up with puff pastry looking like this. 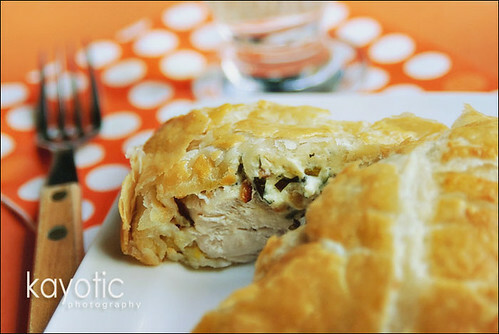 Place the chicken on top of the puff pastry, with the cream cheese side down. Season the chicken with a generous amount of salt and pepper. Beat a large egg, and brush a little on the edges of the puff pastry. Just fold them until you end up with small packages. The egg will function as a glue. Lightly brush the top of the puff pastry with the egg as well.